2017 marks the 200th anniversary of Jane Austen’s death. 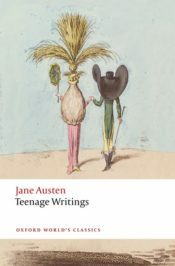 In honor of Austen, Oxford University Press has published Teenage Writings. Three notebooks of Jane Austen’s teenage writings survive. The earliest pieces probably date from 1786 or 1787, around the time that Jane, aged 11 or 12, and her older sister and collaborator Cassandra left school. By this point Austen was already an indiscriminate and precocious reader, devouring pulp fiction and classic literature alike; what she read, she soon began to imitate and parody. Unlike many teenage writings then and now, these are not secret or agonized confessions entrusted to a private journal and for the writer’s eyes alone. Rather, they are stories to be shared and admired by a named audience of family and friends. Devices and themes which appear subtly in Austen’s later fiction run riot openly and exuberantly across the teenage page. Drunkenness, brawling, sexual misbehavior, theft, and even murder prevail. Watch as Professor Kathryn Sutherland and Doctor Freya Johnston, editors of the Oxford World’s Classics edition of Teenage Writings, discuss Jane Austen’s early writings and how they reflect the novelist she would become. Featured image: “Diary…” by edar. CC0 Public Domain via Pixabay. Kathryn Sutherland is the editor of Austen-Leigh's Memoir of Jane Austen and Other Family Recollections for Oxford World's Classics. She has created a digital edition of Jane Austen's Fiction Manuscripts (2012), the print edition of which is due to be published by OUP in 2017. She is the author of Jane Austen's Textual Lives: from Aeschylus to Bollywood (OUP, 2005). Freya Johnston is University Lecturer and Tutorial Fellow in English at St Anne's College, Oxford. She is the author of Samuel Johnson and the Art of Sinking, 1709-1791 (2005) and general editor of The Cambridge Edition of the Novels of Thomas Love Peacock (2016).